Preview images and spoilers for the Once Upon A Time In Wonderland episode "Bad Blood"
“Bad Blood” is the title of the December 5 episode of Once Upon A Time In Wonderland. The episode will look into Jafar’s past. “Bad Blood” – When Alice discovers that her father is in Wonderland, they begin healing their broken relationship, which leads to her having to make a difficult decision. 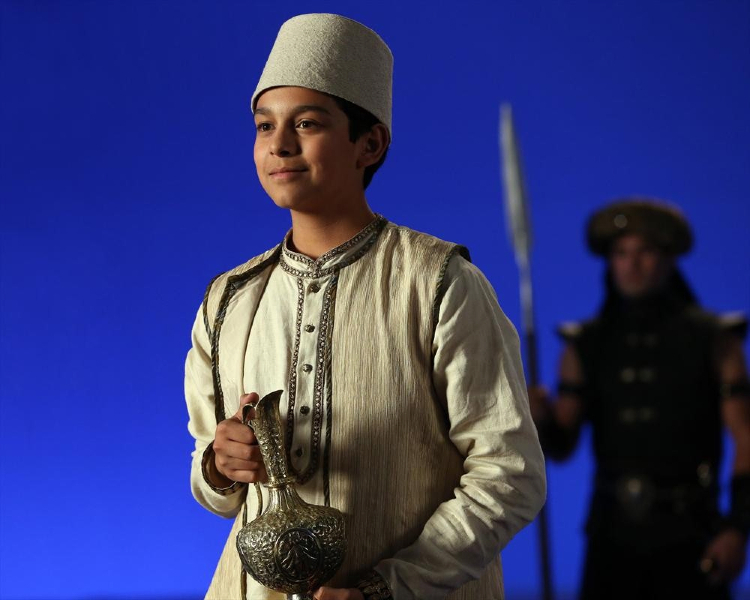 In flashback, a young Jafar is emotionally distraught after his mother dies and we find out what drove him to become the unforgiving villain he is today, on “Once Upon a Time in Wonderland,” THURSDAY, DECEMBER 5 (8:00-9:00 p.m., ET) on the ABC Television Network. “Bad Blood” guest stars include Anthony Keyvan as Young Jafar, Shaun Smyth as Edwin, Matty Finochio as Tweedle #1, Ben Cotton as Tweedle #2, Brian George as Old Prisoner. “Bad Blood” was written by Jane Espenson and directed by Ciaran Donnelly. ABC has also released a whole lot of preview images to promote this episode. Look for some episodic photos as well as some behind the scenes blue screen shots within.